Are you on the search for professional oven cleaning in London? Baking and munching on cakes and cookies are two fun things to do; but cleaning the oven, not so much. So if you’re a baking enthusiast but you hate cleaning your oven, it’s time to consider hiring expert oven cleaners. If you contacted the right one, you won’t have to deal with any grime in your oven anymore. Talking about expert over cleaners, Premium Cleaners London is the solution to that. For many years now, our cleaning company has been providing the best cleaning services in London. We always aim for 100% customer satisfaction. Why use our professional oven cleaning in London? All cleaning teams we send to clients are knowledgeable enough, skilled and highly experienced. We provide training to make sure all our cleaners have a full understanding of our cleaning standards. Our oven cleaners clean in a timely manner so that your daily schedule won’t be affected. Nevertheless, they also ensure that their output is excellent and worth paying for. Our over cleaning service is reasonable prices – click here to view our prices. Regardless of the type of oven you have, you will be charged accordingly and straightforward. On that note, you don’t have to worry about hidden charges and over-pricing. We use cleaning solutions that are highly effective in removing dirt but at the same time, safe for your oven and for the food you will soon be cooking. We never compromise the health of our clients and their families as well as the quality of their ovens. Premium Cleaners London is fully insured and our cleaners are also insured with full public liability insurance. With this, you don’t have to think of unwanted and abrupt expenditures due to accidents. 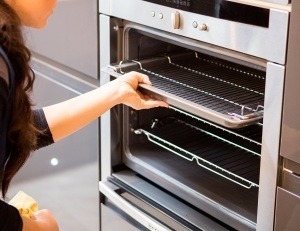 For more information about our oven cleaning in London, please give us a call on 020 3322 6018 and ask for our best rates.